Can You Drink Lemonade When You Have Diarrhea? Diarrhea is caused by a variety of factors including poor digestion, dietary allergies, high-sugar diets, lactose intolerance, influenza, gastritis and intestinal parasites and infections, among others. If your diarrhea is caused by pathogenic microorganisms, drinking lemonade may be beneficial because of its antimicrobial properties. However, if your diarrhea is caused from consuming too much fructose or is a reaction to the Lemonade Diet, then you should avoid further lemonade consumption. If you're experiencing severe diarrhea, contact a medical professional for treatment. Diarrhea can be an intentional strategy by your body to rid itself of pathogenic microorganisms and toxins, or it can be a sign of imbalance and disease, according to "Harrison's Principles of Internal Medicine." In moderation, a bout of diarrhea can be beneficial as a cleansing and detoxifying action. However, in excess, diarrhea can lead to dehydration and electrolyte imbalance, which can quickly lead to a medical emergency if not properly remedied. Overuse of laxatives to induce diarrhea and lose weight is a dangerous practice and should be avoided. Natural lemon juice is rich in citric acid and vitamin C, which is also known as ascorbic acid. Both acids exhibit antimicrobial properties; vitamin C is able to stimulate and enhance your immune response, according to the Linus Pauling Institute. As such, drinking moderate amounts of unsweetened lemon juice may be beneficial for diarrhea if the cause is related to bacterial, viral, fungal or parasitic infections. 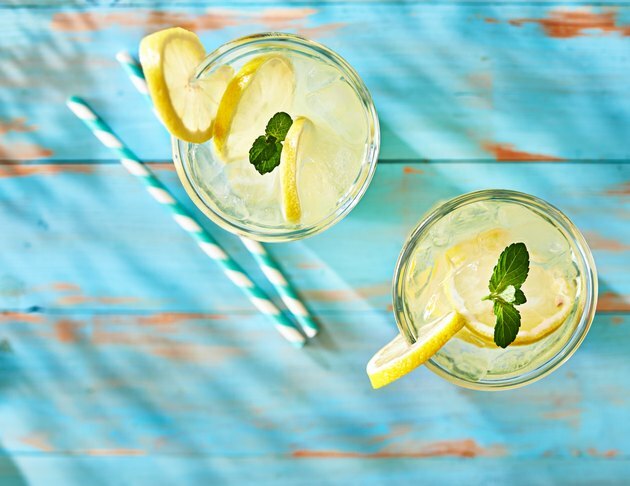 Natural lemonade is also a source of water, some electrolytes and calories. Sweetened lemonade may taste better than unsweetened natural varieties, but excess sugar and artificial sweeteners can be a cause of diarrhea. Simple sugars, such as fructose and glucose, are quickly processed and absorbed by your body. However, in excess, the sugars can spend too much time in your intestines and provide the friendly bacteria with a substrate for fermentation, which produces gas, flatulence and loose stools, according to "Advanced Nutrition and Human Metabolism." Further, many artificial sweeteners cause an osmotic effect by drawing water into your intestines, resulting in watery diarrhea. The Lemonade Diet is a short-term, juicing cleanse meant to flush your body of pathogens, toxins and impurities. It usually lasts 10 days or so and consists of fresh-squeezed lemon juice, purified water, maple syrup, cayenne pepper and herbal tea. No other food or beverage is permitted during this cleanse. A major side effect of this cleanse is abdominal pain and diarrhea, which is regarded as desirable by some because it offers proof of the "flushing affect." However, you should always be under the supervision of a health professional before embarking on such dramatic dietary changes. With excessive diarrhea and abdominal pain, your physician may recommend refraining from drinking anymore lemonade. Is it Good to Drink Gatorade If I Have Diarrhea?